Standing somewhere in the upper five foot range T'Rae is by no means short for a Vulcan woman. Her body is tall and lithe with most of her height in her legs, but is hardened by her military training. Her face is sharp, with high cheekbones and hard onyx eyes, softened somewhat by the gentle curve of her upswept eyebrows. She is an analytical woman, her eyes constantly taking in the details around her, especially of the people in the area. A generally unassuming woman the most striking feature of her is her hair. A failed experiment left it changing a myriad of colors, patterns, and various degrees of luminescent. On occasion it will turn back to her natural black, but it rarely stays this way for long. Other than it's wildly varying coloration her hair falls just past her shoulders and is often tucked behind her ears, though lately she has started pulling it back into a pony-tail more often. Since landing on Planet T'Rae has begun varying her wardrobe. 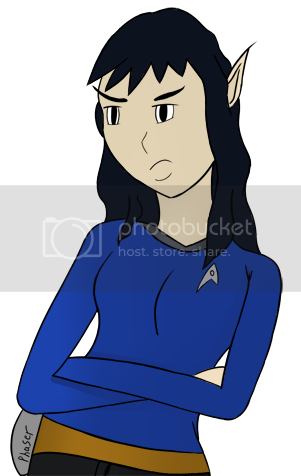 Often she still wears her starfleet uniform, but also has a more traditional set of Vulcan robes, a (very) small number of dresses, and a variety of pant-suits for more formal occasions.